By focusing on one clean, crisp color, I discovered a range of beautiful plants with distinct sizes, scents, and textures. I am no Vita Sackville-West, nor am I the owner of an exquisite English country manor, such as her fantastic Sissinghurst. But I am an avid gardener, and I am an enthusiastic collector of many kinds of plants. Years ago, on my very first trip to England, I visited Sissinghurst and saw my very first white garden. Conceived by Sackville-West, the English novelist and poet, and now maintained by the National Trust, the White Garden has inspired many of us to think carefully about monotone themes and how to incorporate them into our own backyards and personal landscape designs. 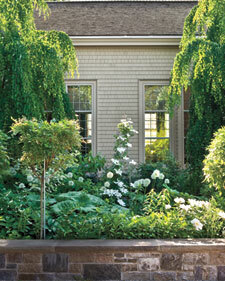 In Bedford, right by my back steps, is a walled rectangular space that I have designated my white garden. Taking note of the white-blooming plants in other well-known gardens, such as those at Hidcote Manor Garden in England, and at various friends' gardens in the United States, I began compiling lists of white-flowering perennials, grouping the plants according to their varying sizes, heights, scents, and blooming times. Before putting anything in the bed, I planted two large weeping katsura trees in the rear of the garden, flanking the four triple-hung windows in the dining room wall. In the front of the garden, I planted four tree-form white-blooming wisterias, hopeful that they would thrive and add a bit of mid-height interest to the garden. By the way, when the wisterias bloom in May and June, the driveway and entrance are perfumed with an extraordinary sweetness. 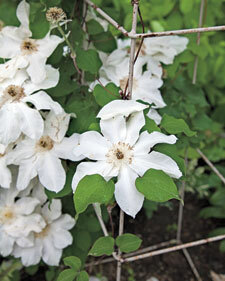 A single pyramidal tuteur planted with a robust white clematis adds more height to the center of the garden. Because of the variety and different textures of the plants, and the fact that the white flowers are visible by day and night, this garden has been a success, and it continues to inspire me as well as my guests. 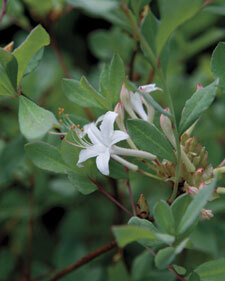 Woody plants frame the white garden and provide a darker background for the pale flowers. Two tall weeping katsuratrees (Cercidiphyllum japonicum 'Pendulum') flank the windows of my formal dining room. In the foreground, two wisterias (Wisteria floribunda 'Shiro Noda') trained into tree form let me have the dramatic, fragrant flowers of this vigorous vine without having to build a structure to support its rampant growth. 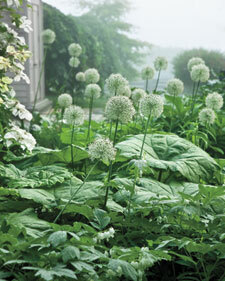 Dozens of 'White Giant' alliums hover over the huge leaves of Astilboides tabularis. 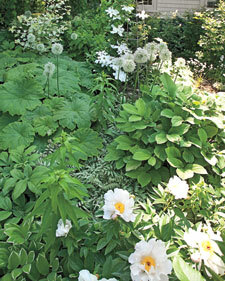 The massive foliage helps to cover the alliums' withering leaves when the flowers stop blooming. The astilboides produce white flowers that grow up to four feet high in early summer. Clematis does well trained on an upright tuteur as long as you take into account its specific needs. I sited the base of the vine among large-leafed perennials that can provide the shade and cool environment that the clematis roots require for proper growth. 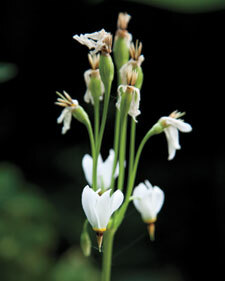 From top: White shooting star (Dodecatheon meadia f. album) is a form of the native pink shooting star. 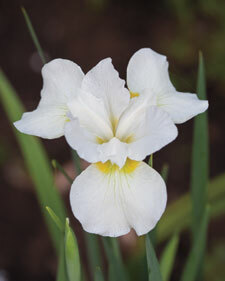 Siberian irises remain true stalwarts of the garden, and this white-blossom variety is just as bold as its purple kin. 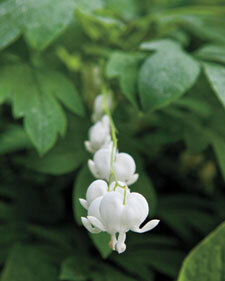 Bleeding heart (Dicentra spectabilis 'Alba') brightens shady corners of the white garden. 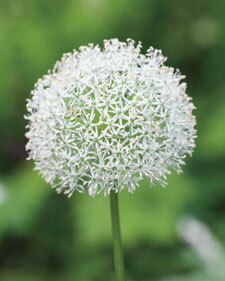 From top: A close look at an allium flower reveals the starry florets that make up the large, frothy spheres. With so many ephemeral flowers in this small garden, it is important to have shrubs to anchor the plantings; this swamp azalea (Rhododendron viscosum) is delightfully fragrant. 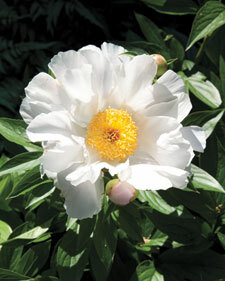 Single or semidouble flowered peonies provide sturdy foliage all summer; their golden pollen-encrusted stamens stand out very nicely in a sea of white blossoms.